New files relating to the military service carried out by the immediate family of Uachtarán na hEireann Michael D Higgins have been released today. Under the mammoth Military Service Pensions Collection project being undertaken by Military Archives and the Department of the Defence, more than 2,800 files about 882 men and women were published online this morning. Included in the 117,000 scanned pages are details of John, Peter, Michael and Kitty Higgins’s activities between 1916 and 1923. Michael D’s father John took part in the War of Independence and fought on the anti-Treaty side in the Civil War. He began his service, aged 24, with the Ballycar Coy of 1 Battalion, East Clare Brigade in 1918 and later transferred to – and served as a Lieutenant with – the Charleville Coy, 4 Battallion, Cork 2 Brigade. His employment as a travelling sales rep allowed him to engage in intelligence work and he was also active during the Civil War. He applied for a military pension under the 1934 Act claiming service with the IRA between 1 April 1920 and 30 September 1923. He failed in this original application. He also failed in an application for service between 1 April 1918 and 31 March 1919. The most likely reason was the he did not take part in any gun battle with crown forces during the time, a strict criteria in the first round. However in December 1956 - 22 years after his first application and after some political pressure from people known to Higgins – an appeal under the 1949 Act was successful and he was awarded a service pension of 4 and 3/8 years. During his testimony to the advisory committee on 25 September 1936, John said that during the War of Independence he undertook a number of tasks, including blocking roads and raiding garages and post offices. He also claimed to have burned down houses in Charleville on 9 July 1921, moved arms and munitions, cut telephone wires and carried dispatches. He was part of a group which attacked Ballylander barracks in May 1920 and raided a night mail train at Charleville station on 19 June 1920. His file carries references to him having acted as a scout during an attack on Colonel Hope at Ballyhea and being involved in the burning of Lord Kenmare’s residence. raiding Charleville Post Office for dog licence money. His activity continued during the Civil War during which he was involved in an ambush at the Frollock Cross and “sniped at Boolard Cross”. He recalled that he was on the run from July 1922 but was arrested on 26 January 1923 after which he was sent to Limerick and interned in the Curragh before being released on 21 December 1923. He had by this time lost his employment and told the deciding committee that it was difficult to obtain a new job because of his status as an ex-internee. Included in the fascinating snapshot of the Higgins family history is his four-page sworn statement, a handwritten service pension application form signed and submitted by John himself and handwritten letters of reference from Michael Gary, Michael Sheehy, P O’Brien and Seán Noonan. Files pertaining to Michael D’s two uncles – Michael and Peter – were also released today. Peter served as a Lieutenant in the Ballycar Coy and was “very active” during the War of Independence. He then enlisted in the National Army and served as a sergeant in HQ Company of 4 Infantry Battalion, 1 Western Division. He was awarded a 7-year service pension. However, the third brother Michael was not successful in his pension application as the activities he carried out – such as dispatch carrying and supplying tools – were not deemed to be active service. 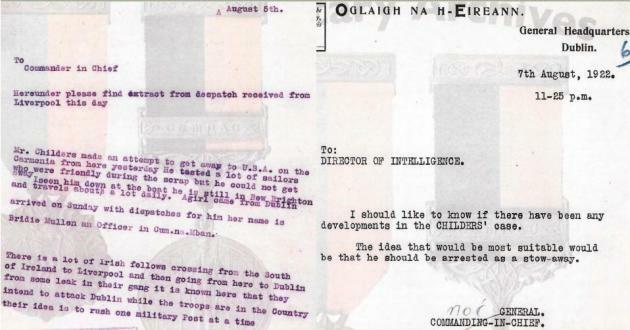 Kitty Higgins, Michael D’s aunt, was a member of Cumann na mBan, serving as a branch treasurer. Although she never received a service pension, details of her work are outlined in her application. During her time she made tricolour flags, provided food to members of a Flying Column and to those in internment camps and carried dispatches. Both Michael and Kitty received the Service Medal (1917-1921). Michael D Higgins has acknowledged his family’s roles in the wars, most notably in a 1993 interview with Joe Jackson in Hot Press magazine. “I remember taking part in debates with people who say that 1916 was a waste of time and I don’t accept that because this is to impose a set of motivations and rational requirements on people who participated in what they felt to be something very important, which led to the foundation of this state and led to the institutions of which I now am a part,” he said, before acknowledging that his family were afflicted by the common split of the civil war, setting brother against brother. John and Kitty Higgins could both be labelled anti-Treaty, while Peter and Michael were on the opposite side. It’s also true that my father was involved in the War of Independence, as were my uncles. And my uncles were on one side in the Civil War and my father was on the Republican side. I’m very aware of all that being part of my family history. Included in today’s tranche of files are a number of documents relating to the arrest, detention and execution of Robert Erskine Childers in November 1922. With an establishment background, the best-selling author had served with British forces in both the Boer War and World War I. However, he then became a gunrunner for the Irish Volunteers and a propagandist for Dáil Eireann and the IRA. He also acted as secretary to the Irish delegation for the Anglo-Irish Treaty negotiations. I should like to know if there have been any developments in the Childers’ case. The idea that would be most suitable would be that he should be arrested as a stowaway. At that point in August 1922, Childers was believed to have been trying to escape to America. He was eventually arrested on 22 November that year and executed 14 days later. Separately today, Minister Simon Coveney has announced the extension of the archive project until 2023 to ensure the “story of our revolution” is digitised.